This was a David S Adventure over the Easter long weekend. 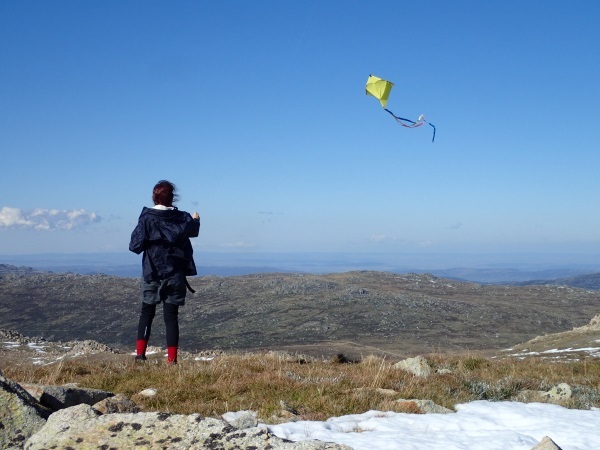 Many years ago, Johan V came up with the idea, going up to the top of Kosci and flying kites each day, and it became a regular event on the MSS calendar for a few years. And so with only a little encouragement, David agreed to run the trip this Easter. A week before Easter there were six of us going but, for a variety of reasons, it ended up being just David, Cathi H-H and me. 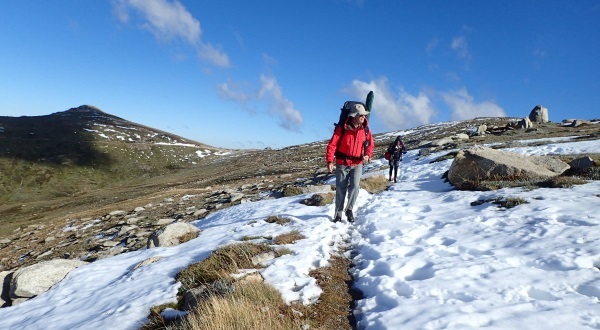 Kosci had had 20cm of snow the week before so David impressed upon us that we’d need to take the conditions into consideration. Cathi and I decided to share her 2-man tent which was a four-season tent (as opposed to my Hubba which wouldn’t have coped in high winds!). So, we set off on Thursday around lunchtime and drove down to Cooma to stay the night at the caravan park. 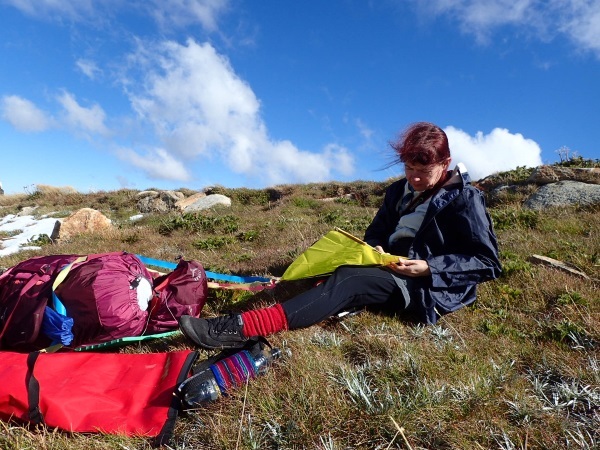 We were up bright and early next morning, taking a side trip up to Mt Gladstone to admire the view and then off for breakfast at Lott Food Store Bakery & Café (fabulous eggs benedict), meeting up with Heather and Trish who were off to do their own adventure. The view from Mt Gladstone, first thing in the morning, with the mist in the valley. David was behind us on the chairlift. 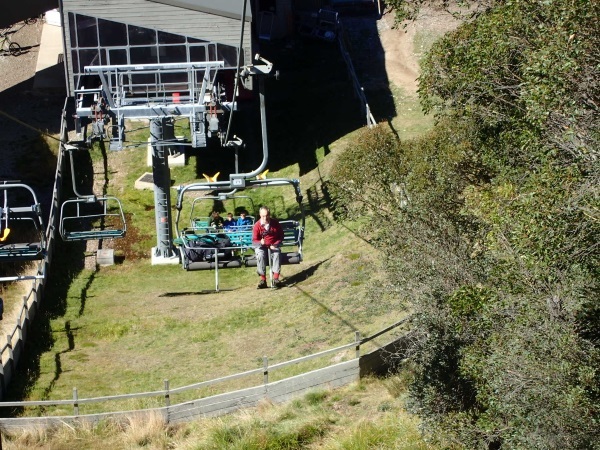 The yellow things on the back of the chairlifts are to hang mountain bikes off the chair lifts, there’s a great bike track going from Crackenback all the way down to the village. 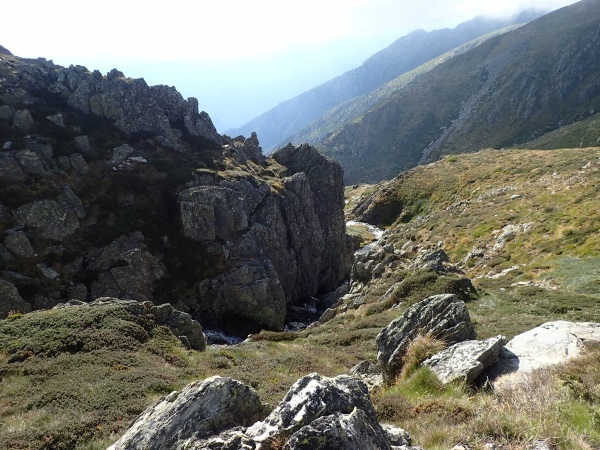 A stream with snow melt just off the track up to Kosci. 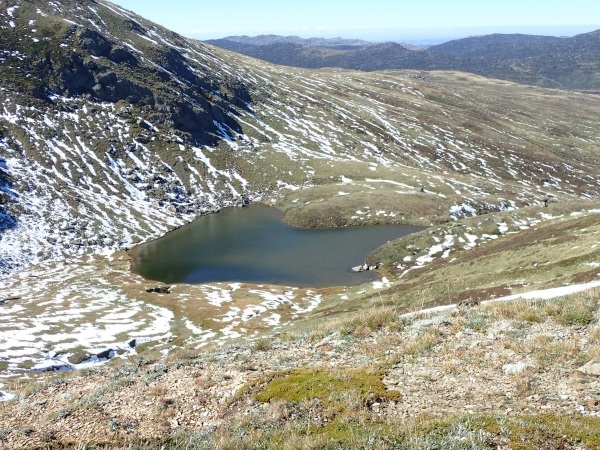 Looking down on Lake Cootapatamba, on the southern flank of Mt Kosciuszko, less than a k away from the mountain and one of only six glacial lakes in Australia. 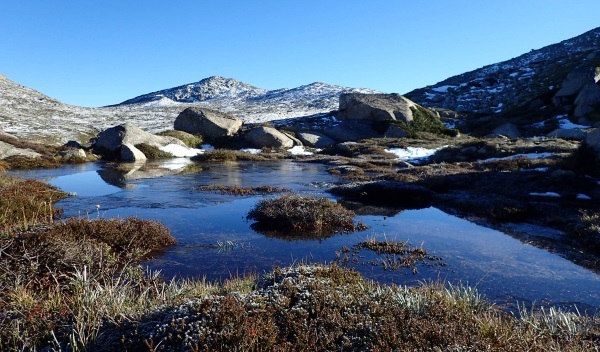 Finally we’re at Rawson’s pass where you head up to Mt Kosciuszko. Here’s David pointing out where we are on the map to some tourists. Because of the good weather and the fact that there was snow on the ground, there were hundreds of people on the track on Friday. Snow still on the peaks and a little on the ground, the scenery was stunning. 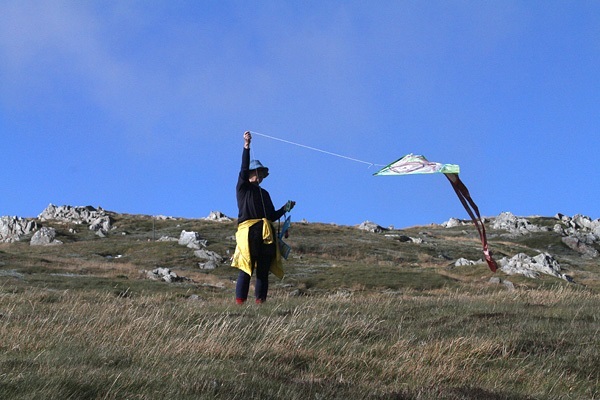 Up on top of Kosci and the first kite comes out – this kite was sewn by David when he was recuperating from an injury (it’s scaled down to half the size of the pattern). 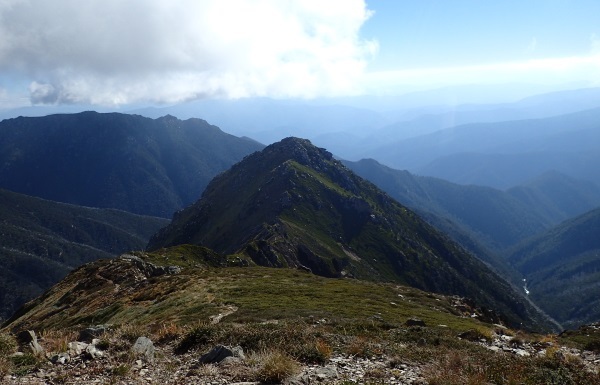 You can just see the walking track in the middle distance. There had to be almost a hundred people up on the summit! Cathi doing a few running repairs on her kite (note the red sox). For those who aren’t MSS members, this was a Red Sox Event, we all wore our Explorer Red Sox which denotes it as an easy trip. Next kite out was the UFO, this kite was two spherical silver discs that spun around and sparkled in the sun, another home made kite by David. Cathi’s kite now airborne, unfortunately it started losing bits of its tail and every now and then a small piece would flutter to the ground. David’s clown kite, when he put this one up first, it just stayed aloft, and he tied the string onto his pack and just walked away to fly the UFO, what an amazing kite! 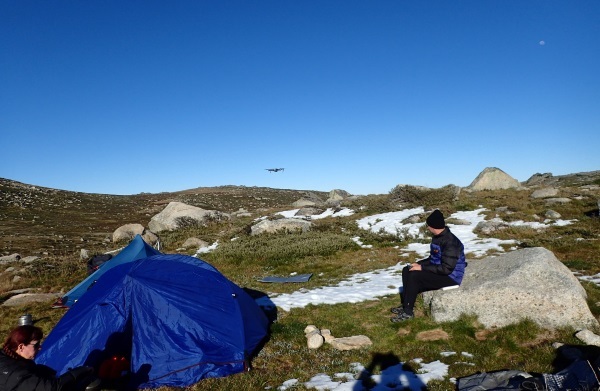 It was now getting late, so we left the crowds of people on the summit and headed over to our campsite for the night via the Main Range track, Mt Kosciuszko in the distance. 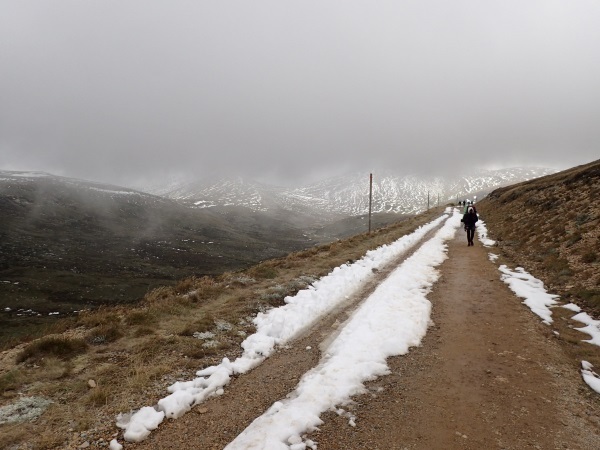 There was occasional snow across the track, but most of it you could avoid. Looking down into the Wilkinson Valley. 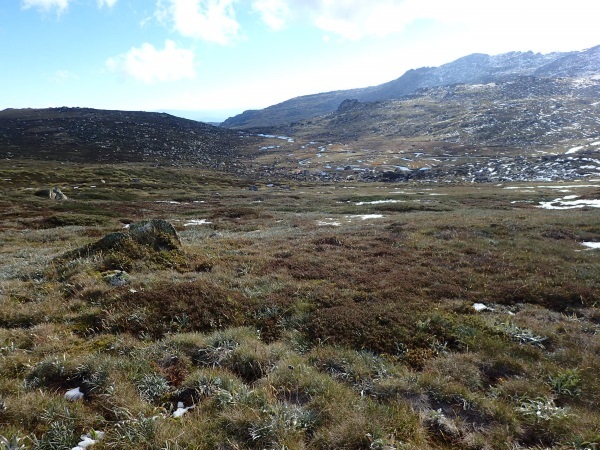 Most of my walking in the Snowy Mountains was years ago and you virtually had the place to yourself, a real wilderness experience. Not any more, in this lovely valley there had to be 30 other people in 20 or so tents, fortunately it was a big enough valley that we were spread out, but it was still a culture shock for me. 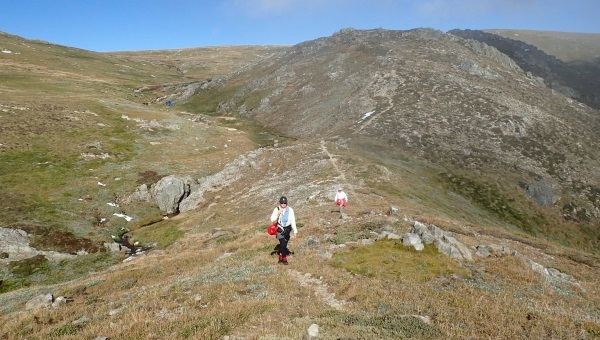 Walking down from Muellers Pass to the valley. David’s usual campsite was cut off by the swollen Wilkinson Creek (from snow melt), so we found this nice spot up high and away from almost everyone else, we had a nice creek beside us and we were able to drop down beside it to get out of the wind to cook our dinners. 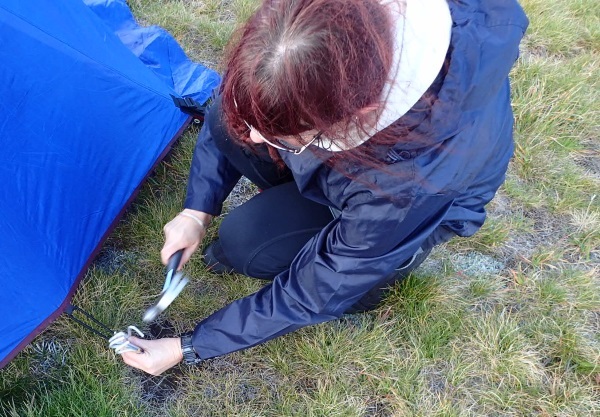 Cathi is the only person I know who carries in a hammer to hammer in her tent pegs! Sunset on Friday night. It was quite cold and very windy so we were in bed as soon as the sun went down. David set up his GoPro to take a time exposure film of the stars and the moon rising, the stars were incredible and if it hadn’t been so cold I would have stayed up so our star expert, Cathi, could point out all the different constellations. 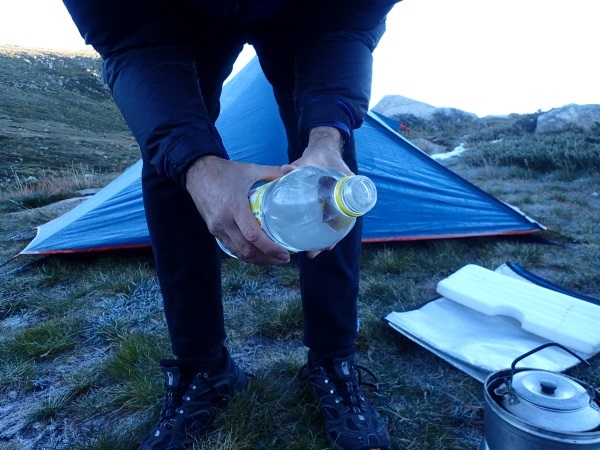 The wind dropped overnight along with the temperatures, here’s David’s water bottle that was frozen solid. It also took a long time to light the trangia stove. 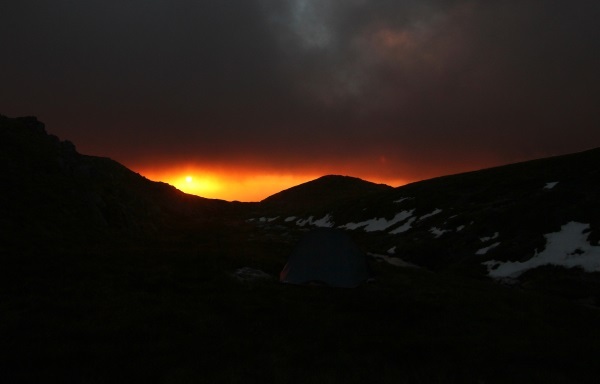 I had put my gas bottle into my sleeping bag at around 5am to warm it up … I was toasty warm during the night mainly due to the sleeping bag (big thanks to Jeff B for his super-duper sleeping bag), and some hand warmers. The surface of a small tarn beside our campsite froze over night. Mt Townsend is in the distance. 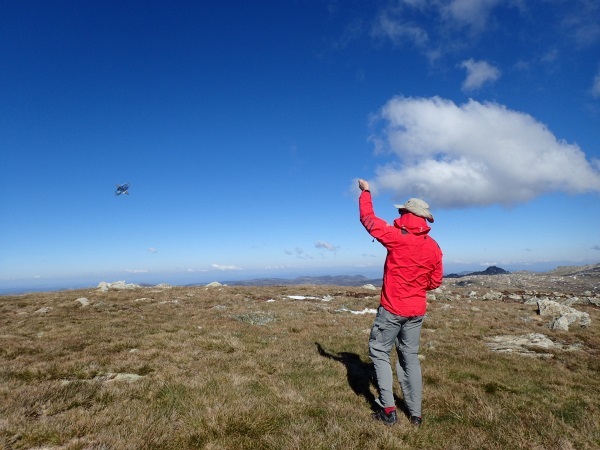 David got out the drone and did a bit of filming in the morning before we set off. 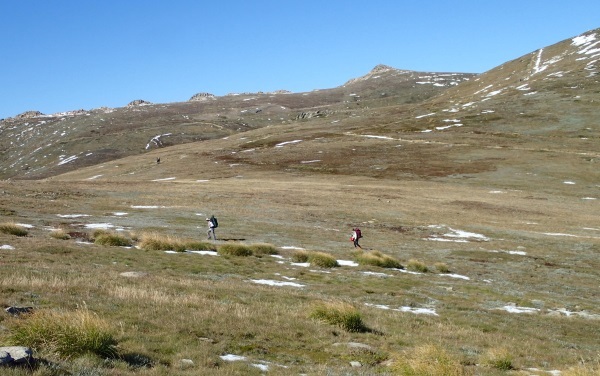 Saturday morning, walking up to Mueller’s Pass and the Main Range track. Looking down to Lake Albina and the start of Lady Northcote canyon in the distance at the end of the lake. Brought back memories of doing this canyon (Easter 2001). This is a no-camping zone (it’s another glacial lake), but we heard the next day that there were 15 tents down there on Saturday night, despite signs all around saying no camping. 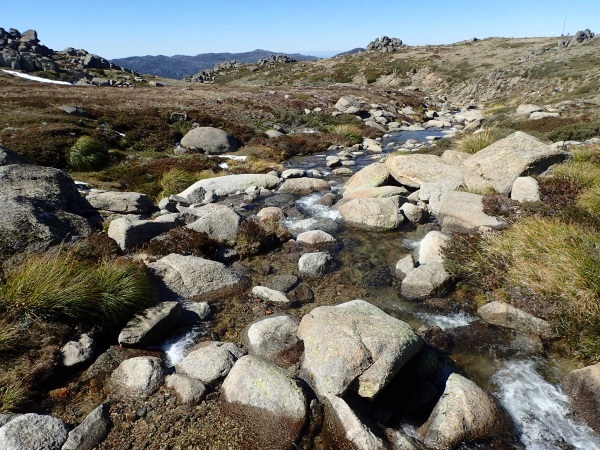 This section of the track up to Carruthers Peak is paved with granite slabs. 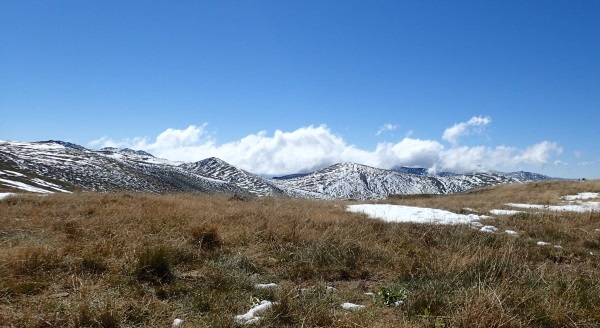 We headed off Carruthers Peak and down to the side track up to Mt Tate which would take us to our destination, Strzelecki Creek which flows on the right hand side of The Sentinel a lovely knife-edge ridge that you see here, there’s a trig on the top of the peak. 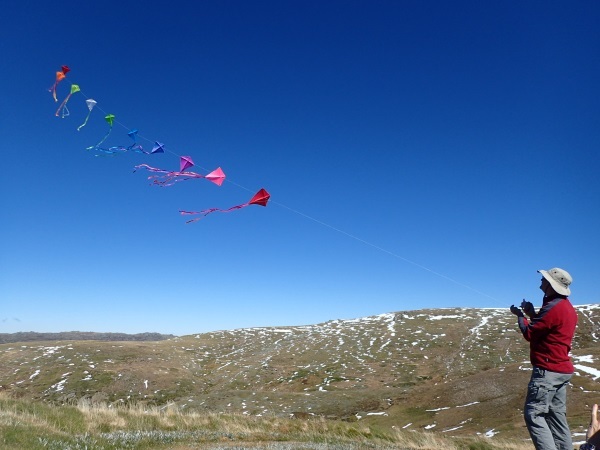 We stopped for a snack and Dave got out his piece de resistance kite, ten kites all strung together, it was amazing to watch them, the photo doesn’t do them justice! We took the indistinct track to The Sentinel and eventually camp to David’s preferred campsite, only to find that someone else was already there, so we headed about 100m upstream and found this nice spot, water right beside us and we couldn’t see the other tent so there was a real wilderness feel about it. 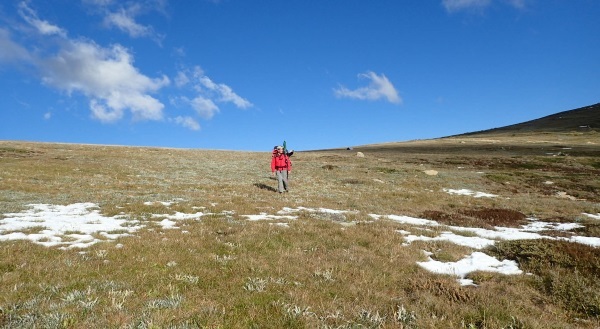 Cathi checking out whether there were any lumps and bumps in the snow grass and whether or not we’d be on a slope. After setting up camp (you can just see the blue of our tents in the valley close to the top of the pic), we headed out to look at The Sentinel, it was too late in the day to do the whole trip out, plus we didn’t want to do the climb up to the top (both David and I had already done it before). 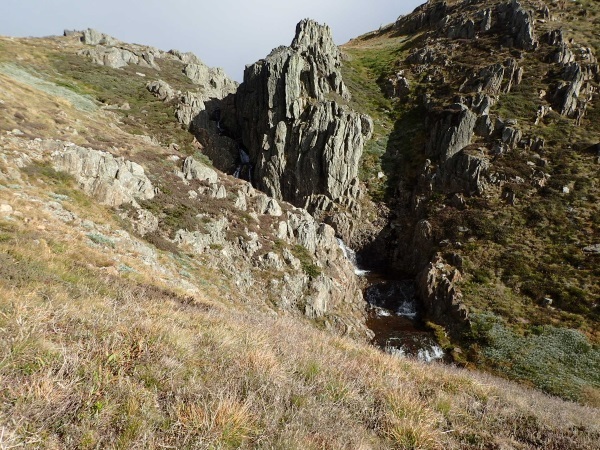 The Sentinel close up, the track goes up the knife edge of the spur, very exposed in places. After getting our fill of the views, we headed back to the creek and checked out the small waterfalls. David’s preferred campsite is just behind the hill on the left and is beside the waterfalls. 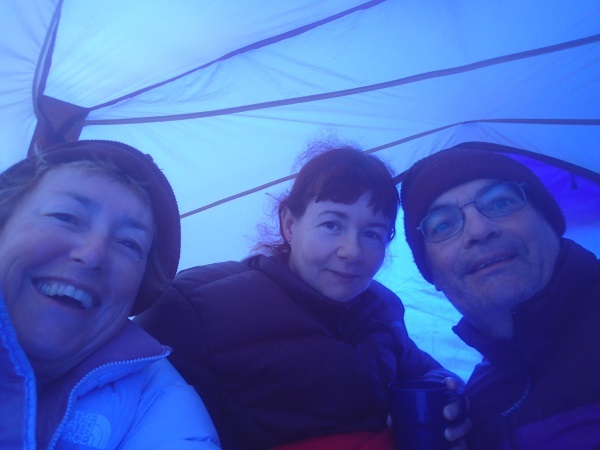 The wind came up over night and it was way too cold to be outside so we all had morning coffee in Cathi’s party tent, it was a little squishy! We were undecided as to what we’d do. The wind was ferocious, gale-force and it was very, very cold. 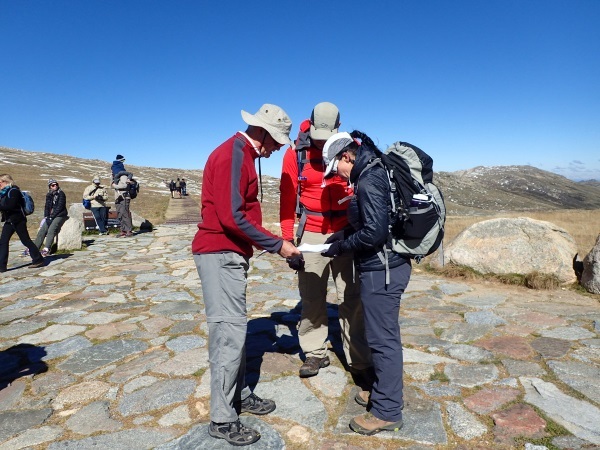 The original plan was to head back the way we’d come, but we decided that we’d head over to Charlotte’s Pass. Cathi hadn’t been there before and it was an opportunity to take her to Blue Lake. 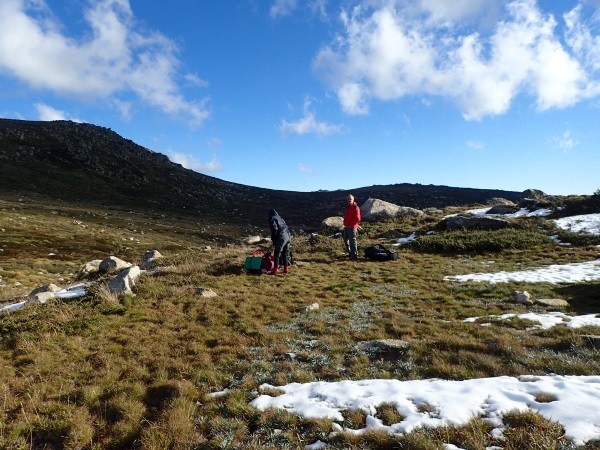 Plus, we could either camp in the valley below Seamen’s Hut where it would be sheltered, or continue down to Thredbo if the weather didn’t improve. Panorama of Blue Lake, with the clouds rolling in and no let up in the wind. 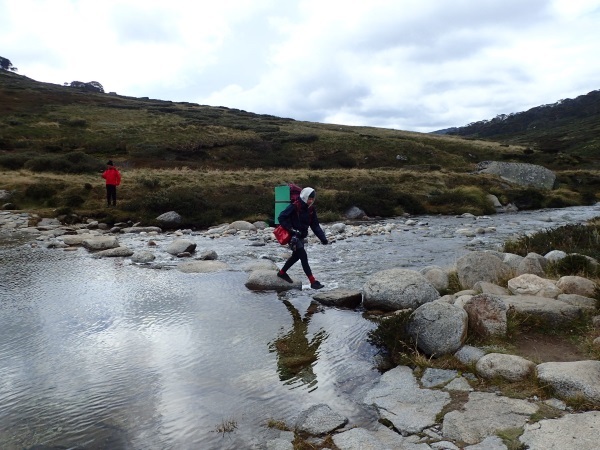 Cathi crossing the Snowy River on the stepping stones. 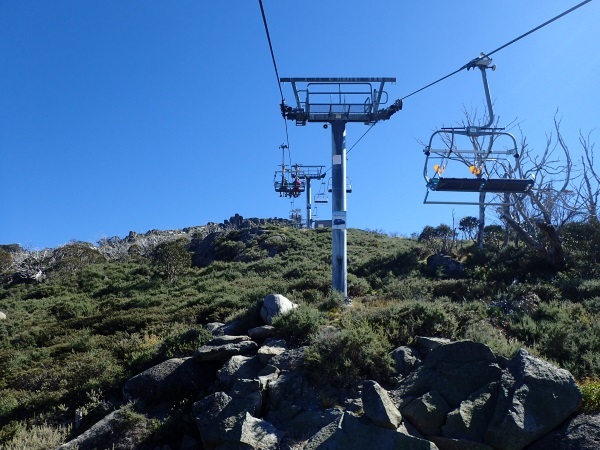 We headed up to Charlotte’s Pass and had a quick snack and decided that if we didn’t stuff around, we’d be able to get to Rawson’s Pass and down to the chairlift before the last one at 4.30pm. It was just too cold and windy to be enjoyable, we’d had two great days, so it was no big deal to cut the trip short by 1 day, cramming the last two days into the one. 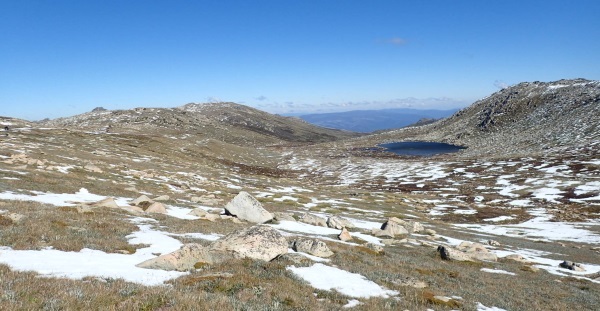 Panorama of the valley with the Snowy River in the middle distance taken from the road to Rawson’s pass. The wind was coming straight across the valley on our right, I found it was bearable if I covered my face with my scarf. 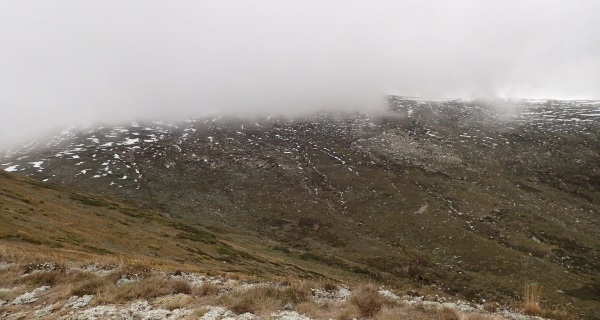 This section of track (or road as vehicles use it to get to Rawson’s Pass), was all up hill for 8k, interestingly, the full circuit (from Charlotte’s Pass to Kosci via Blue Lake and Rawsons back to Charlotte’s Pass) is 19.9k and early in the morning around 10.30am we’d passed a man and his son going up the way we’d just come down. I remembered them because the kid was wearing shorts and I had grave concerns that he didn’t have enough clothes on. They passed us on this section of the walk at about 2.30pm – boy they were fast! Looking down into the valley just near Seaman’s Hut, you can’t even see Kosci and the wind still hadn’t let up. When we got to Seaman’s Hut we stopped inside for lunch and brewed a cuppa to revive ourselves before setting off again. 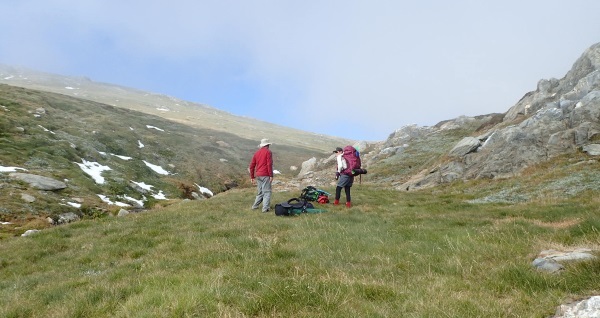 Finally on the last part of the track down to Crackenback. By this time we were stuffed and the trip was officially “an epic”. 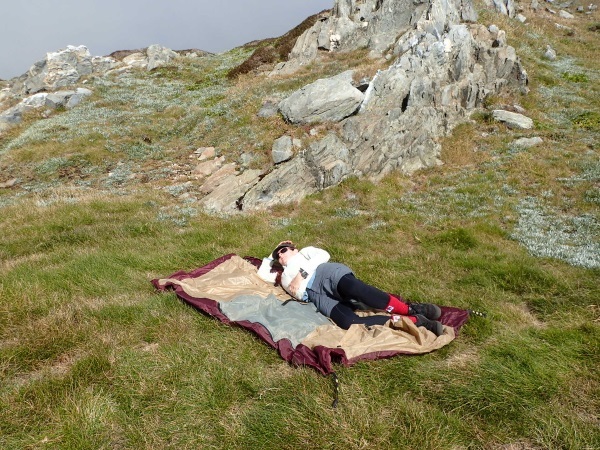 Our hips, legs and knees were complaining and all that kept us going was the thought of a hot shower and a soft warm bed for the night. 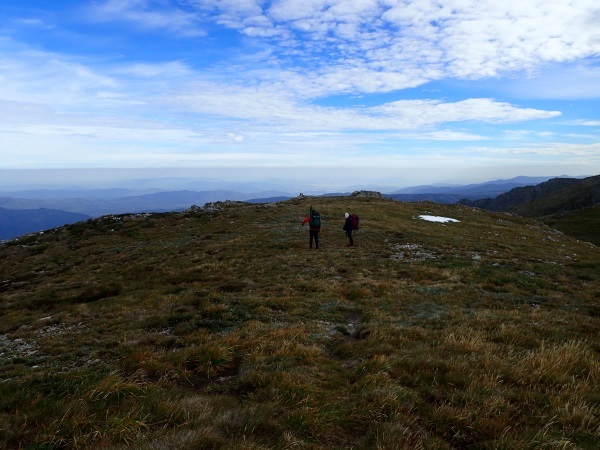 By the time we’d arrived at Crackenback, we’d walked roughly 18k in the one day – what were we thinking! 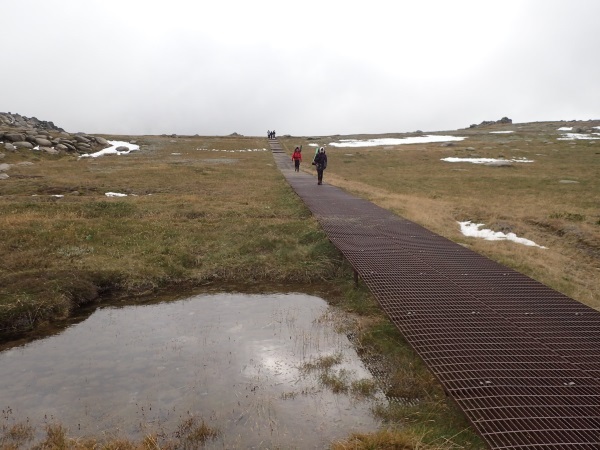 We were down in Thredbo Village by 4pm and on the road to Cooma and The Bunkhouse with promises of warm showers and a great meal (all promises fulfilled). On Monday we set off on a leisurely road trip back to Sydney given that we had a little time up our sleeve, thanks for driving David! This was a great trip, and flying kites each day was amazing, thanks to David for his great organisation (as usual) and to Cathi for her company! 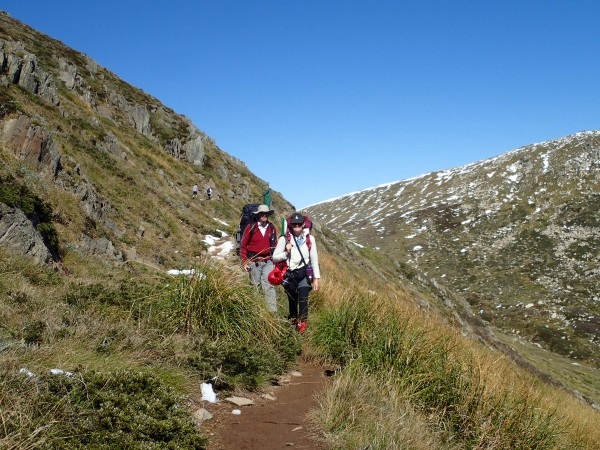 This entry was posted in Bushwalking, MSS, Road Trips. Bookmark the permalink. Wow, amazing photos, they look like something out of National Geographic! Ah, Mel, flattery goes a long way! Not quite NG quality but getting better! Awesome photos, it always looks so magical with the snow, loved the kites . 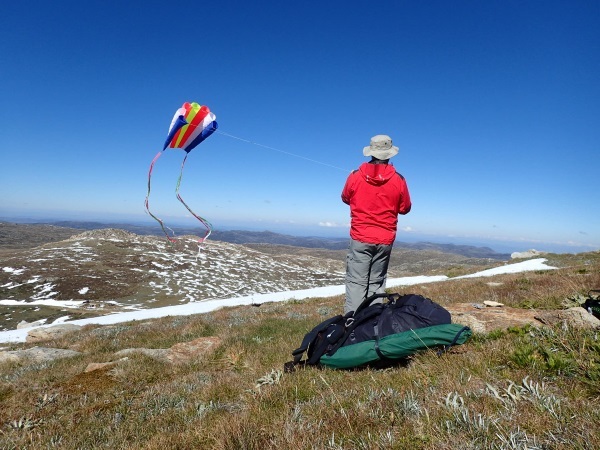 Yes, it was magical, particularly the frozen tarns and it was so cool seeing David’s 10 kites up strung out so far! 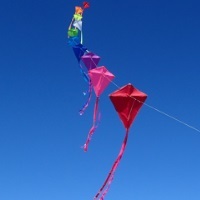 Kites were great. I had sold the idea to David for the Sound of Music intro, but then when it came time to execute the scene, it was either too cold or our “hill” wasn’t high enough or too many people around. Plus I didn’t take my tent so didn’t have a tent fly for my skirt, although I did have the apron. Julie Andrews eat your heart out! You never cease to amaze me with your wonderful adventures Marilyn. Hey Leanne, how are you going? Yes, they are adventures, you still have many years of adventuring ahead of you though, you’ve just got to get out there and go for it … well, when the kids are older maybe! Cracking trip you guys! Thanks again for coming along! Well M & DS we’re thinking of selling up & moving south in the hope we could tag along on some of your adventures. Where were you JV? Yep, that was a good one, but I know you’re only teasing me about moving down here. As for JV, home looking after Tiffany and nursing a head cold.